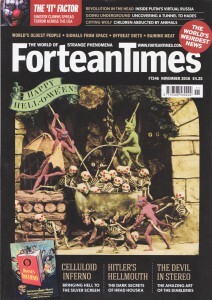 One Night in Hell was chosen to be the featured cover story in the November Halloween edition of ForteanTimes. In the article, Brian May describes the moment he first encountered a Diablerie card and how his fascination grew over time. The four- page spread details the history of stereo cards and the evolution of Diableries in 19th century France and England. While early works showed illustrations of the Devil, spirits, and ghosts in books and on stage, One Night in Hell proves that Diableries are moving into new media in the 21st century. More information can be found on pages 26-31 in the November edition of ForteanTimes.